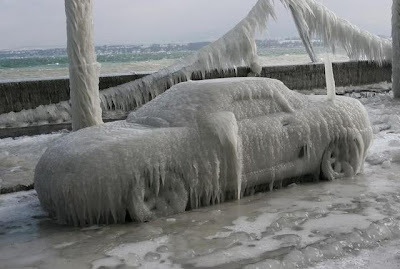 This past week the team at LM has been working at a breakneck pace to "Freeze the Body". ....And that element is now the Body design. 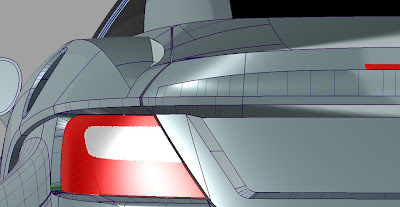 Sometime this week, all details and design elements of the Body surface to include mirrors, openings, returns, cutlines, pockets, bevels, reveals, and more will all be decided and locked from change. Once this happens, engineering will be able to move forward on its final drive to freeze the chassis and the interior paneling and shut faces of all of the body parts which are displayed on the exterior surface. Once both of these are complete, the Rally Fighter will be a finished skeleton with strong bones and beautiful skin, fit together in its final package. At that point we can go about finishing our work to complete the interior, throw the ignition switch, get it purring, and drive down the Strip in Las Vegas! Still a lot of work to go, but this is a major step forward. Join us this week as we celebrate the Freezing of the Body. A CAD model of the rear left of the Rally Fighter in near "Frozen" configuration. Note the Center High Mounted Stop Light (CHMSL), the left trunk cut line, the fuel door inset, side view mirror, and a very high number of fillets, curves and surfaces defining the body.